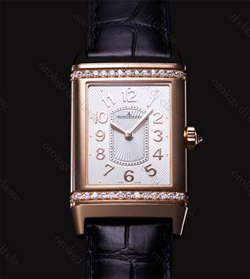 Full name of the new items – Grande Reverso 1931 Rouge. Hours represent the flagship model of a series of Jaeger-LeCoultre, but this time with a red face. 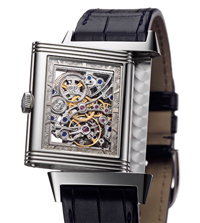 This year’s collection of Reverso 80 years old and almost the entire year rife with new products in this series. 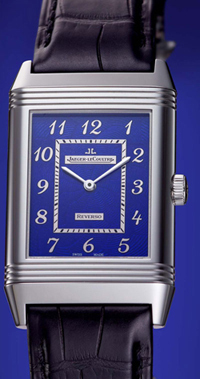 At the end of 2011 the same watch company Jaeger-LeCoultre has decided to pay tribute to the history of the release of this model. 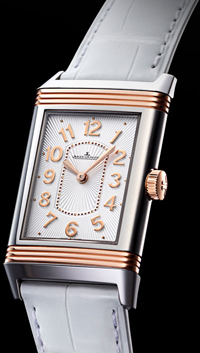 Watch company Jaeger-LeCoultre continues to celebrate the 80th anniversary of the iconic model Reverso. In honor of this significant date throughout the year Jaeger-LeCoultre watches pleases fans with new Reverso. This time for connoisseurs of the line clock set Grande Reverso Lady UltraThin Neva.